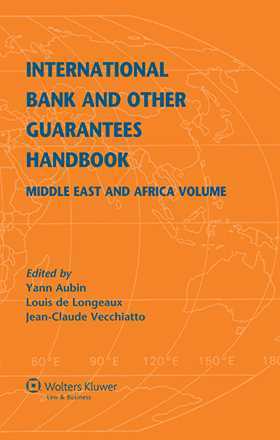 The International Bank and Other Guarantees Handbook provides a practical examination of the laws of 19 countries (and groups of countries) in the Middle East and Africa regions in respect to bank and other guarantees. It also contains, among other things, various guarantees forms. The aim of each country-specific chapter of the Handbook is to provide actionable information designed to guide legal or other practitioners in such jurisdiction. The editors, Mr. Yann Aubin, Mr. Jean-Claude Vecchiatto and Mr. Louis de Longeaux, deal with guarantees in an international context on a daily basis in the course of their respective positions as in-house lawyers of Fortune 500 multinational companies and partner of a multinational law firm. Yann Aubin is the Director of Legal Operations [and Deputy General Counsel] at Schlumberger based in Paris. He is the co-editor of the Export Control Laws and Regulations Handbook. Jean-Claude Vecchiatto is Vice President, Head of Corporate & Project Finance, Legal Affairs at the European Aeronautic Defence and Space Company, EADS, based in France and Germany. Louis de Longeaux is a partner with Orrick, Herrington & Sutcliffe law firm based in China, England, France, Germany, Italy, Japan, Russia, Taipei and USA. The International Bank and Other Guarantees Handbook is invaluable to any international trade professional (lawyer, finance manager, project manager, etc.) or entity with a need to know the specific requirements to be complied within the jurisdiction in question for the efficient use of bank or other related guarantees. Chapter 20 Uganda David Mpanga.